Bollywood and fashion go hand in hand and there are tons of looks out there to keep up with. We’re always keeping an eye out for the best of the lot to give you all the fashion inspo you might need in life. This week saw Bollywood’s biggies step out in style, not like they don’t usually, but this week everyone’s distinct style caught our eye and we decided to put ‘em all together for you guys. You ready? Let’s jump right in..
We absolutely cannot get our eyes off Kriti Sanon in this Deme by Gabriella number. The wrap dress is gorgeously colour-blocked and clad in plaid which is our fave. She finished the look with classic white sneakers which could never be a bad fit on anything. Girls, are you already drooling over Sid’s super chilled out look? We are, too! He looked all kinds of cool in his casual t-shirt and joggers. But that hoodie especially has stolen our hearts. We love his fashion game and are sure you do too! Every time Alia Bhatt steps out in an Indian outfit, our hearts skip a beat. This time, she was in a stunning mint green and red combo by AM:PM fashion. The red dupatta instantly elevated her look and her understated makeup redefined simplicity! The father and son were spotted slaying every bit of their colour-coordination game at Aaradhya Bachchan’s birthday party! They opted for casual outerwear over shirts or tuxes, which was fun and refreshing for us to see! And here they are, making the most stylish exit ever. Name a more iconic duo. We’ll wait. 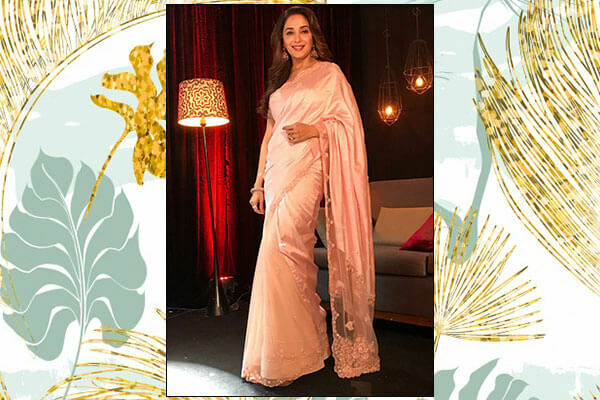 The ethereal and timeless Madhuri Dixit brought her fashionable foot forward (as always) with a stunning pink saree by Jade for the Lux Golden Rose Awards interview. Madhuri’s everlasting romance with sarees is something that makes her stand out from the crowd and makes us wish we too could wear sarees like her. 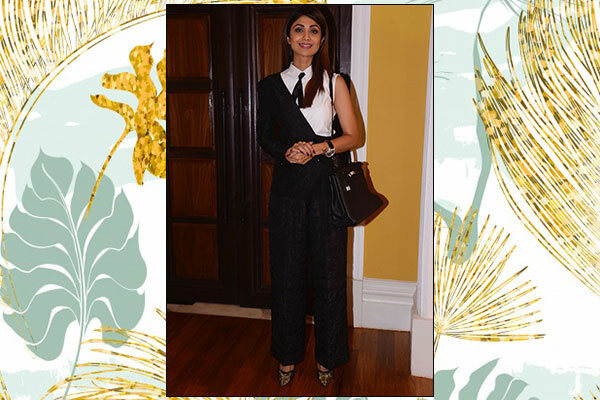 Shilpa Shetty nailed every bit of power dressing in this unconventional power suit by Ashish Soni and shirt by BCBG for the Global Entrepreneurs Summit. She sported a stunning pair of Louboutins and a watch by Cartier to finish the look. Doesn’t she look fierce as hell? We’re crushing hard on Neha Dhupia’s airport look, the tan overcoat, in particular. And this isn’t the first time we’re seeing her in a trench/overcoat with casual separates and sneakers at the airport. Guess, Neha has her favourites and she has successfully inspired us to dress like her at the airport too! Last but definitely not the least, Ed Sheeran! There’s no reason he shouldn’t be on this list, so what if he’s not technically from Bollywood? He partied with the whole of Bollywood though, didn’t he? So, it counts. 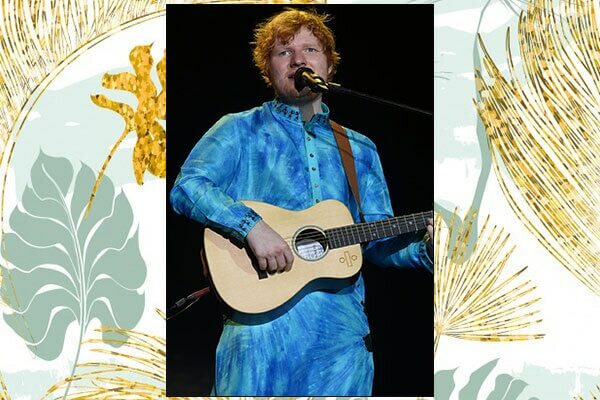 He looked absolutely adorable in his blue kurta when he played live in front of hundreds of people! You know how exciting it is for Indians to see white people in Indian clothes? We felt that too and he made it to this list! That was this week’s roundup of celebrity fashion that we loved! Did you love it too?